What wine to buy for Christmas this year? We’ve got some fabulous offers including a brand new Cordillera Champagne method Sparkling wine from Chile, classic Burgundy Pinot Noir H. de Villamont 2014, Topiary Chardonnay and Late Bottled Vintage 2004 Warre’s Port (complete with complimentary gift box). 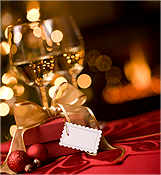 Christmas Wine Tasting – this Sat. November 30th! Do join us anytime from 2.30pm to 7pm this Saturday, November 30th for a free, walk-in tasting in store. We have loads of festive offers available including some fantastic offers not to be missed this year! There’s no obligation to buy, but all tasting wines will be 10% off on the day. Don’t forget, any of our wines can be gift-wrapped and delivered both locally and nationwide. We have a beautiful range of wine gift-boxes that make lovely presents for both family and more corporate clients. Ask in store for details! Look forward to seeing you and have a very merry Christmas! Nic and The Village Vine Team. 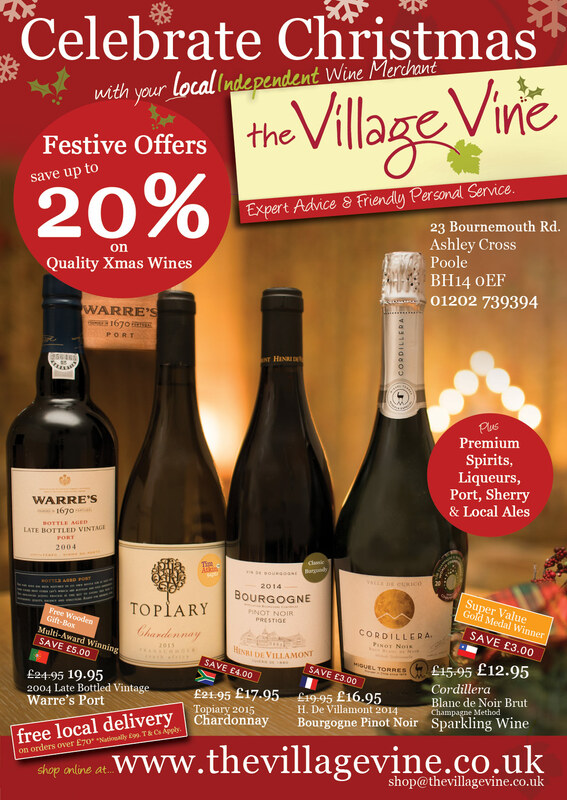 This December, we have two main Christmas Offers at The Village Vine. Or for you champagne lover’s we have buy 2 for £39 on Chateau Deville Carte Noire. This has been our bestselling champagne and is fantastic value. 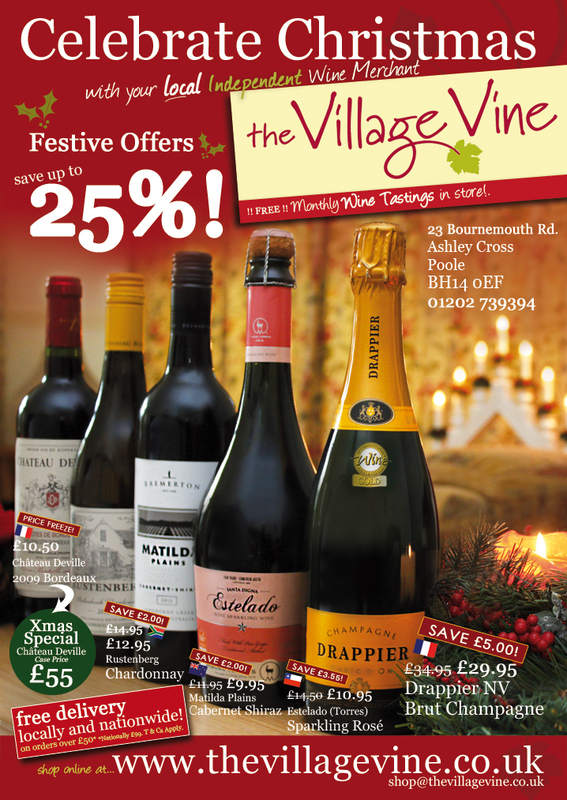 Both offers are also available from our online shop as well as instore: www.thevillagevine.co.uk/shop. Christmas Wine Gift Boxes In Stock! We now have all our Christmas Wine Gift Boxes ready. Any 1, 2 or 3 bottles can be hand gift wrapped for free – we won’t charge you any more than the normal postage rate! The bottles are gift wrapped in a beautiful burgundy gift box filled with decorative shred to give the bottles a nice rustic feel. Perfect for giving to a friend or relative this Christmas who is into their wine. 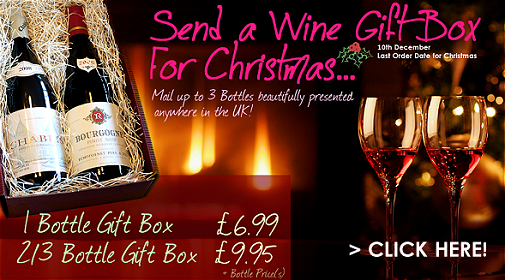 Our wine gift boxes are also brilliant for sending to friends or relatives who live up the country. Not seeing them until the New Year? Then send them a gift box with a personalized message for Christmas. 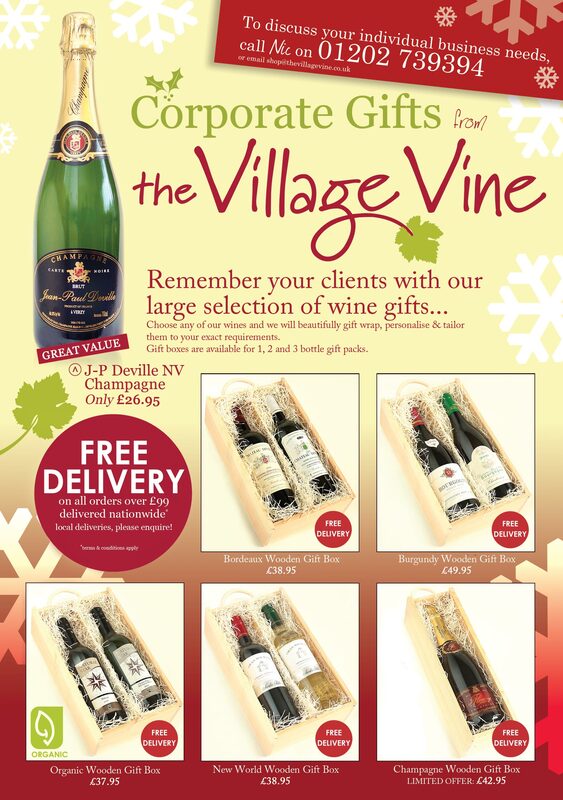 Our pre-selected wine gift boxes are available from our website at http://www.thevillagevine.co.uk/shop – but you can also make up your own custom gift box from any of our wines. Just follow the instructions here at How To Order Wine.